Salads don’t get much crunchier than this Asian Slaw! It is bursting with vegetables, but it is far from boring. 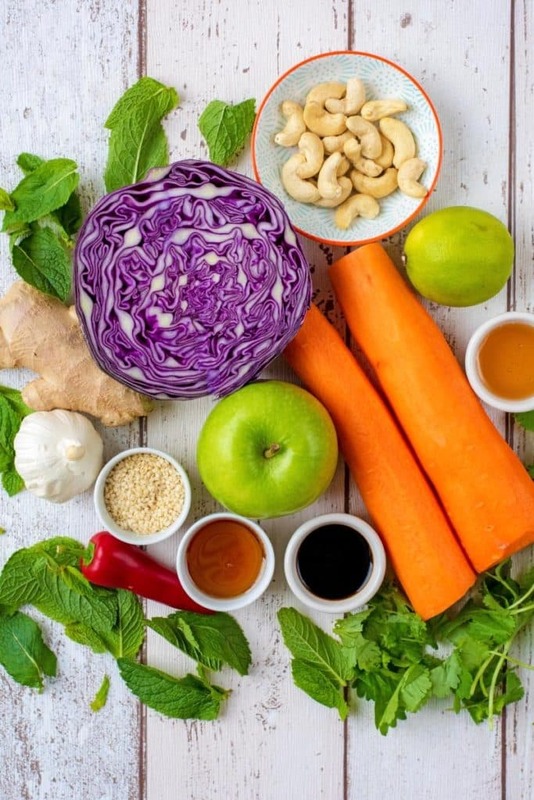 Zesty lime juice, fresh mint and coriander, salty soy sauce, a kick of chilli and some sweetness from the honey bring together the carrot, cabbage and apple for a vibrant side dish. Coleslaw is the ultimate side salad isn’t it? I mean, a burger is incomplete without some on the side and you wouldn’t even think of hosting a BBQ without a big bowl of coleslaw for everyone to dig in to. It’s the simplicity of some crunchy veg in a creamy dressing that everyone loves and it’s indulgent whilst still feeling like you are eating something healthy. 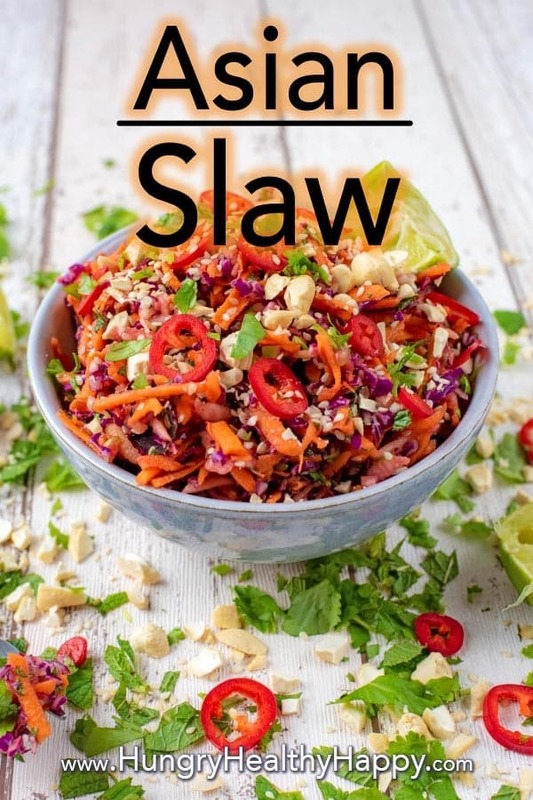 We are always looking for new ways to jazz up the humble slaw and although our Mexican Coleslaw is usually the favourite, I think there might be a new favourite in town. 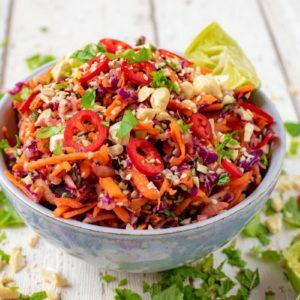 This Asian slaw is still made up with mostly carrot and cabbage, but we have added in some grated apple too for extra crunch and some added sweetness. You will find even more crunch from the cashew nuts and sesame seeds, so it’s a bit of a crunch sensation really. 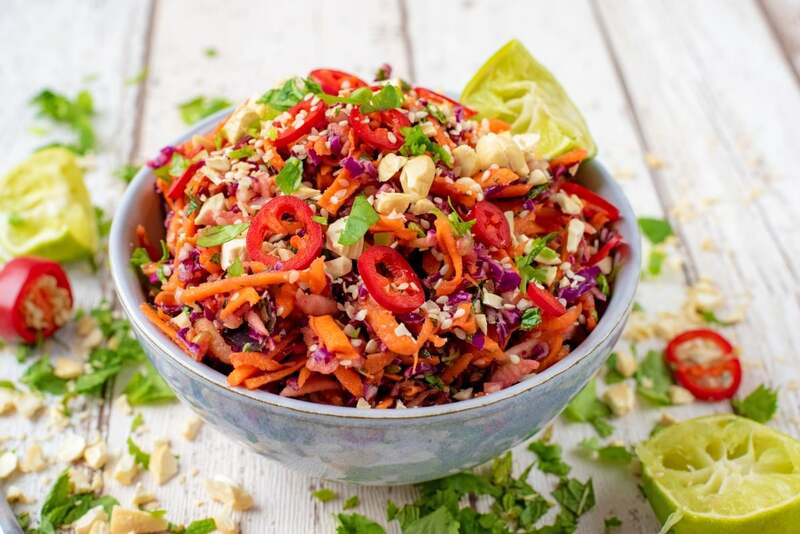 You don’t really think of coleslaw when thinking of Asian food, but this Asian Slaw has some of our favourite Asian flavours in it. Sesame, chilli, ginger, honey, garlic, soy – they are all really bold flavours but they don’t fight against each other in this dish. Instead they would really well together and create a nice balance between the sweet and salty and still has a nice kick of chilli (although you can easily leave that out). What To Serve Asian Slaw With? This is definitely intended as a side salad, but equally you could serve it with some grilled salmon or chicken on top. We usually have it on the side with something like sweet and sour or a stir-fry/noodle dish. We have also stirred it in to our Garlic Prawn Noodle recipe, so make sure you check that one out too! One: Using the grater attachment of a food processor, feed the carrots, cabbage and apple through the food shoot and use the food pusher to make sure they all go through. You could thinly slice everything instead. Two: In a large bowl, mix together the garlic, ginger, lime juice, soy sauce, sesame oil and honey. Tip the grated vegetables in to the dressing and mix well. Three: Pour the dressed vegetables in to a bowl and top with the sesame seeds, chopped chilli and cashew nuts. If you don’t like spicy food, leave the chilli totally out of this dish. This is intended as a side dish, but you could serve it with some grilled chicken or fish on top for a main meal. Make this salad vegan by using maple syrup instead of honey. 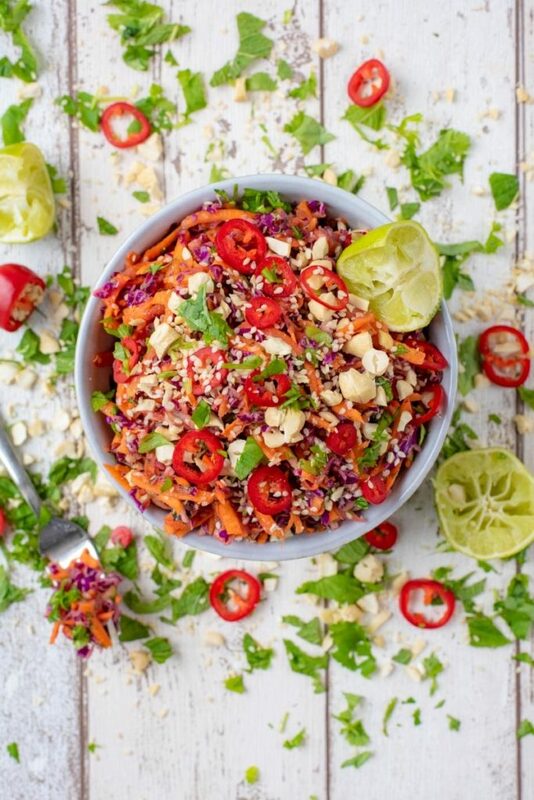 Do you want to be kept up to date on more delicious posts like this Asian Slaw? Please subscribe to the blog mailing list (it takes 30 seconds). If you’ve tried this Asian Coleslaw, or any other recipe on the blog, then let us know how you got on in the comments below, we love hearing from you! You can also FOLLOW US on FACEBOOK, TWITTER, INSTAGRAM and PINTEREST to see more delicious recipe ideas, behind the scenes shots and also what we are getting up to. 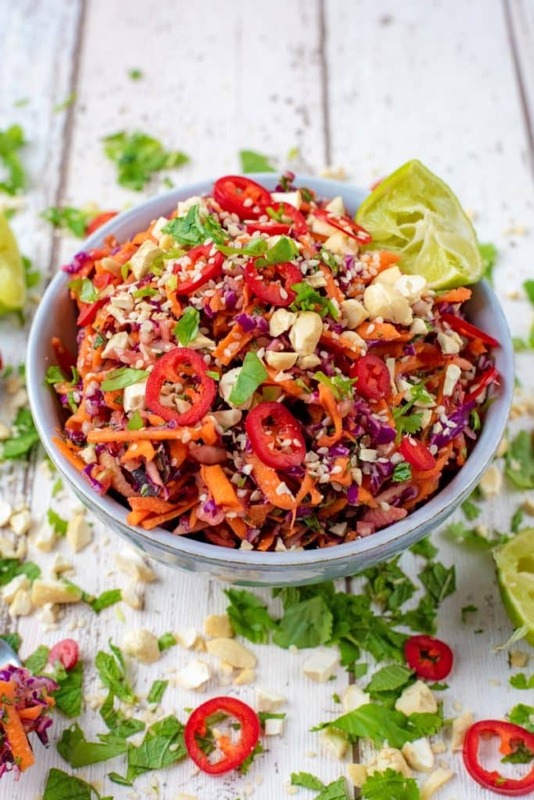 Salads don't get much crunchier than this Asian Slaw! It is bursting with vegetables, but it is far from boring. Zesty lime juice, fresh mint and coriander, salty soy sauce, a kick of chilli and some sweetness from the honey bring together the carrot, cabbage and apple for a vibrant side dish. Using the grater attachment of a food processor, feed the carrots, cabbage and apple through the food shoot and use the food pusher to make sure they all go through. You could thinly slice everything instead. In a large bowl, mix together the garlic, ginger, lime juice, soy sauce, sesame oil and honey. Tip the grated vegetables in to the dressing and mix well. Pour the dressed vegetables in to a bowl and top with the sesame seeds, chopped chilli and cashew nuts. If you don't like spicy food, leave the chilli totally out of this dish. What a wonderful option satifying and a yummy side dish or even for serving as a main dish too. Liek the fact you added peppers yummy! This sounds like a great side dish, or lunch option! Sounds delicious! Honey and apple are everything I never knew I always wanted in an Asian slaw. Look at that gorgeous color!! I am always looking for different slaw recipes and this one has all the ingredients that we love! Love that crunch, it looks delicious. I will definitely try it out this weekend. This is such a healthy dish. So colorful and crunchy. Love the combinations to it. I love everything about this! The colors, the flavors, everything. Making this weekend! I love salads like this! Full of texture and flavour. The apple is a nice addition as well! This looks so easy, healthy, and tasty! I love the additions of cashews. So delicious! I’ve never seen more colorful slaw! Lovely photo and I’m sure spot on flavor! I’d love to put this awesome slaw on fish tacos! It looks so delish and I can’t wait to make it! Loving this hearty and delicious salad idea! So easy and tasty! This is such a nutritious and full of vitamins salad bowl, looks really delicious with this Asian style dressing! This crunchy asian slaw is beautiful with all its bright colors. I also love how fresh and light this recipe is as well. Sounds so good! I love that there’s a little kick in here. Very unique way to make coleslaw. Yum! 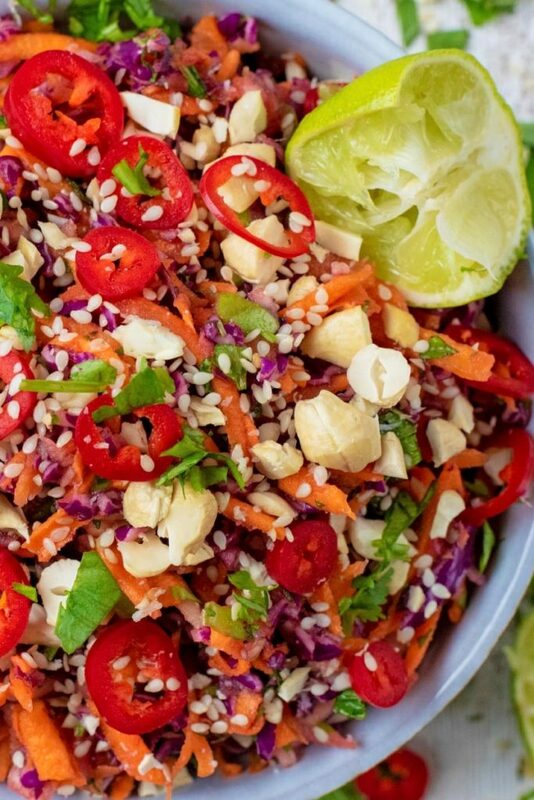 This Asian slaw is such a yummy idea. I also love traditional coleslaw with burgers and bbqs but this would be a fabulous alternative. I’m thinking with fish cakes or chicken burgers! Simple, tasty, beautiful colors. Makes a perfect weekday lunch!